Exchange 2007 and 2010 also have this feature, though the name has changed and so has the location of the controls. It is now considered an Anti-spam technology, therefore navigate to the Anti-spam tab on your Edge Transport server, and select Recipient Filtering. 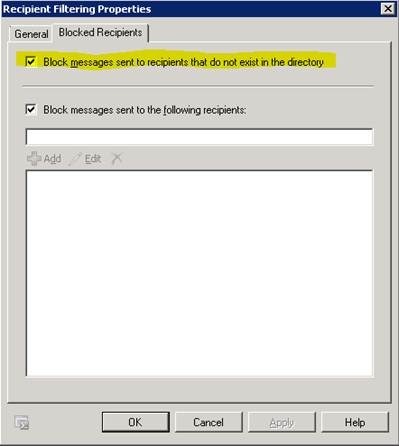 Within you’ll find Block messages sent to recipients that do not exist in the directory on the Blocked Recipients tab. If you are not using an Edge Transport server you can still leverage this feature, however you must first install the Anti-spam agents on your internet-facing Hub Transport server(s). Once you have done this, visit the Anti-spam tab within Organizational Hub Transport Configuration or use the PowerShell cmdlet. Let me describe how this feature works by comparing behavior with it turned off versus when it is turned on. What we see is that with RecipientValidationEnabled set to False, Exchange accepts the email even though the user is not valid! This of course means more overhead on the Exchange server because it has to process the message, only to later realize there is no account for the address. Once Exchange comes to this realization it will send a bounce back message (NDR). This NDR is not only even more processing, but this can contribute to backscatter. Now let’s take a look at the 2nd column, where we have RecipientValidationEnabled set to True. We see that Exchange immediately rejects the message because the user is unknown. This cuts down on processing as well as is a step in preventing the abovementioned backscatter. This also results in faster bounce back messages because they are generated by the sending server, not the receiving (our end) server. If the sending server does not know to generate an NDR, the sending user may be unaware their message did not reach its destination. This could aid a “hacker” in a directory harvesting attack. Because Exchange quickly reports on the validity of email addresses, it could be used to learn what accounts are valid and what are not. Despite the abovementioned risks, I usually DO enable this feature. It is worth noting that being “hidden” from the GAL or other address lists has no impact on this feature. They still receive their mail just fine. Will enabling this feature cause Exchange to reject mail for recipients in shared address spaces or address spaces not handled by Exchange mailbox servers at all? This is a good question, because recipients in internal or external domains will NOT be in your Global Address List, and therefore it sounds like the feature will block mail sent to them. The good news is, this is not true. Exchange will accept mail for any account in an Internal or External relay domain! While this is good news for those users, remember this reduces the effectiveness of the feature itself. Consider a scenario where I share @mikecrowley.us across 2 mail systems. In this case, some of my users would have exchange mailboxes, and others would not. Even if I set RecipientValidationEnabled to True, Exchange would accept mail for all users in the @mikecrowley.us namespace. This is because it has no way of knowing what mailboxes might exist on the other system. The way to leverage a shared namespace WITH this feature is to create contacts or mail-users for each remote user, and set the Accepted Domain type to Authoritative. yep! backscatterer.org inspired this post! 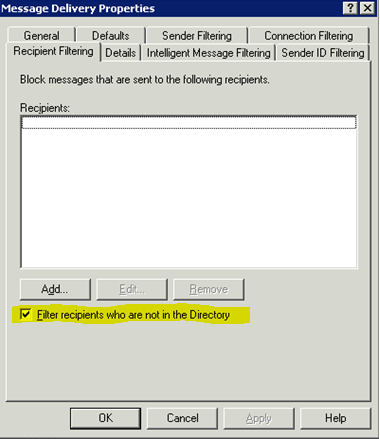 What about Application relay email( mail relay) to any unknown address like printer etc.. If that is accomplished by a service mailbox, it would be included. If however you are talking about receive connectors, that is not a “recipient” per se and not on this report. We can block on the “rcpt to:” area no doubt, but, how about in the “mail from:” area? Do you have any idea how to block fake senders? Most of the spammers are using that method.